Chris Cox captures his third Road to the Horse title and is named the first Legends of Colt Starting Champion. It was without a doubt the most electrifying event in the eight-year history of Road to the Horse; The World Championship of Colt Starting. Three leading U.S. equine clinicians competed on the same ground for the first time: Pat Parelli, Clinton Anderson and Chris Cox each put their talent on the line. The event was held at the Tennessee Miller Coliseum in Murfreesboro, February 25-27, 2011. The three men competed against each other over three days, in front of sold-out crowds, with horses they had not seen or worked with prior to the event. 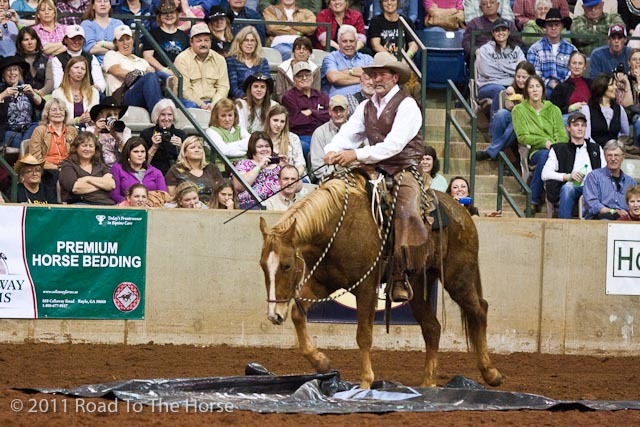 Pat Parelli brought his horsemanship Savvy. Clinton Anderson displayed his Downunder Horsemanship. But in the end, it was the earnest determination of Texas cowboy Chris Cox that won the judges’ favor and earned him his third Road to the Horse championship title and the first Legends title granted by the event. “We thought it looked like [Cox] had the long-range plans of the horse in mind,” judge Bill Enk said. “It looked like he was preparing his horse for the next step in training the whole time.” Parelli, Anderson and Cox were allowed three hours to select a young horse from a remuda of registered American Quarter Horses provided by the famed 6666’s Ranch of Texas, and then over the course of the weekend, to start that colt under saddle. As the competition phase of the event began, owner/producer Tootie Bland told the crowd “I truly believe we are the luckiest people alive to be able to see these amazing men work with these fabulous horses.” During the first day of competition, the clinicians chose their colts; each horse had a different sire. Cox chose a grey gelding; ‘Perfect Performance’, sired by ‘Sixes Pick’ and out of ‘Best Performance’ by ‘Special Effort’. Anderson chose a chestnut gelding; ‘Fletches Career’, sired by ‘Royal Fletch’ by ‘Jae Bar Fletch’ and out of ‘Career Model’ by ‘Eddie Eighty’. Parelli chose a sorrel gelding; ‘Hey Whiskey’, sired by ‘Paddys Irish Whiskey’ and out of ‘Hey Doll Baby’ by ‘Juno Dat Cash’. All of the colts were foaled in 2008. The different breedings seemed to come out in the horse’s very different personalities. Parelli’s sensitive sorrel colt, ‘Hey Whiskey’, looked like an easy pick at first, but a defiant streak lurked just below the surface. The colt showed a lot of resistance to anything above him on his right hand side and during an early round of the competition, Pat Parelli was bucked off the troubled sorrel colt. Anderson’s chestnut gelding, ‘Fletches Career’, on the other hand, was fractious and reactive from the beginning. The colt’s explosive attitude was shown by way of an occasional bucking-bronc-worthy kick as he was being worked under saddle. Cox’s gray gelding, ‘Perfect Performance’, stood out from the crowd as being sensitive and insecure. The colt seemed to be looking for leadership, which allowed Cox to play the role of confidence builder; a job the clinician took very seriously. Indeed, each trainer seemed to take the time needed to get to know their colts in each of the horse’s own unique way; although they used different methods to get there. By round three, each trainer had all had good rides on their horses and there was no clear leader. The final round, however, required the trainers to take their colts through all three gaits on the rail of the arena and then complete an obstacle course with such challenges as weaving in and out of poles, walking over a tarp, jumping low rails and dragging a log by a rope. Anderson drew the first go, his sorrel colt stayed true to form and didn’t make it easy for him. The gelding bucked a bit during rail work and refused to walk over the tarp, but in signature style, the Aussie trainer ended on a good note. Once finished with the required obstacles, Anderson took off his horse’s bridle and rode him in a no-holds barred freestyle at a gallop around the arena to a standing ovation from the crowd. Cox was the second trainer to make his ride during the final round. A glitch in his hands-free microphone threatened to complicate his chances before he’d even set foot on the horse, but the technical crew replaced his headset quickly, and he went on to a successful ride on his grey gelding. The cowboy from Mineral Wells, Texas, easily took his colt from a walk to a trot, and then a lope in each direction and made it through every obstacle in the course. He even chose to dally his rope to his saddle horn during the log-dragging portion of the event even though it wasn’t required. 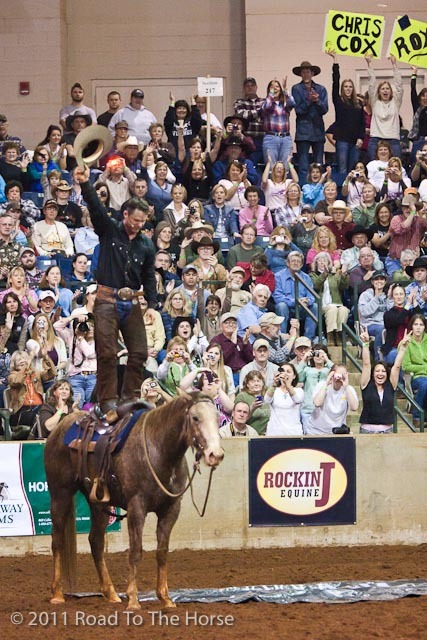 The energy in the arena grew steadily during Cox’s routine, and by the time his theme song, “I am Just a Cowboy,” was played during the freestyle performance, the audience was on its feet. 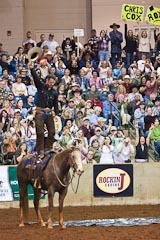 Cox then stood on the back of his horse, raising his hat over his head in what has become the signature maneuver of this event. Cox then jumped off his horse and made a victory lap on foot, high-fiving fans. His gelding waited patiently, demonstrating the connection that Cox had desired. Cox then removed the horse’s saddle and led him from the arena. Finally, it was Pat Parelli’s turn. 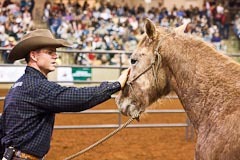 Parelli began his routine by announcing that he and his wife, Linda, had purchased the colt he was working with from the 6666 earlier in the day. Parelli was slow, light and deliberate while building a relationship with his new colt. Before he got in the saddle, he pointed out that he would be using a traditional hackamore instead of a snaffle bit. The decision seemed to sit well with the sorrel, who carried Parelli quietly through the rail work and through each obstacle on the course. The pair culminated their weekend together with several celebratory cantering laps around the arena before stopping and asking for a prop – a large green ball. Parelli bounced the 4-foot diameter ball 10 feet above the horse’s head on its sensitive right side while the colt stood calmly. They exited the arena to a standing ovation and the strains of “Troubadour,” by George Strait. As it had been in the first rounds, there was no clear-cut favorite to win after the final round was completed. When the suspense was finally broken, there was a cheer from the audience as presenting sponsor; Western Horseman magazine publisher Darrell Dodds, announced that the most points had been awarded to Chris Cox. Cox received a $10,000 winner’s check, a custom-made Martin Saddle, by limited edition print by artist Susan Edison, custom spurs by bit & spur maker Daryl Davis and the title of Road to the Horse Legends World Champion of Colt Starting. AQHA, the official remuda sponsor, presented their ‘Traveler’ bronze trophy award to the esteemed 6666’s Ranch to honor them for breeding Cox’s colt; Perfect Performance. The award is named for the American Quarter Horse Association’s founding sire who was inducted into the American Quarter Horse Hall of Fame in 1994. The sheer talent of the trainers and quality of the 6666’s horses made Road to the Horse 2011 a special experience for all involved. Judge Jack Brainard seemed to speak for everyone when he called the event “impressive”. Road to the Horse, the World Championship of Colt-Starting, is unlike any other event in the equine or entertainment industry. The three-day sold out event matches three of the country’s best horse trainers and clinicians of today against one another as they train unbroken colts to ride in just a few short hours in front of a packed live audience and television cameras. By combining education, edge-of-your-seat suspense, entertainment and the love of the horse, Road to the Horse has been responsible for solidifying the position of today’s horsemanship heroes and launching the careers of tomorrow’s hottest new stars. In the process, the event itself has become a catalyst for the advancement of natural horsemanship. 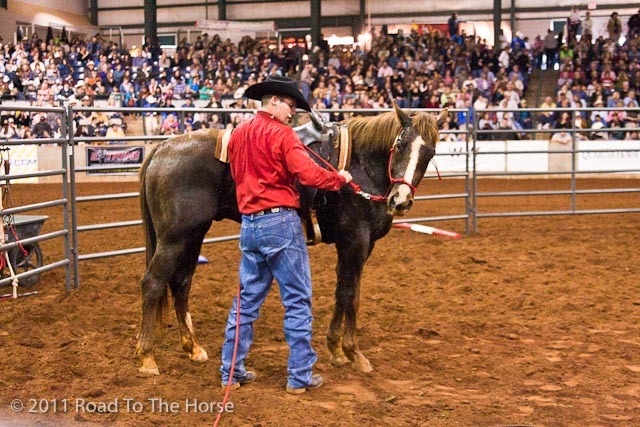 Spectators are guaranteed not only to have a good time, but also to walk away with training knowledge that will improve their relationship with horses. Road to the Horse is proud to partner with many outstanding companies across the equine industry including Road to the Horse presenting sponsor; Western Horseman and strategic partner AQHA along with Nutrena, PRE-VENT Feeders, Quarter Horse News, Barrel Horse News, Horses Magazine, abi Equine, Pyranha Inc., Martin Saddlery, Gist Silversmiths, Horsecity.com, WW Livestock, Valley Vet Equine, Wahl Clipper, Callaway Farms Manufacturing, Extreme Mustang Makeover, Lucerne Farms, MacroAir Technologies, Hoofbeats Magazine, Rockin J Horse Stalls, Prichards Distillery, MGM & Associates, 3M Vetwrap, eZall, Turnbow Trailers, JW Brooks Custom Hats, TWHBEA, Flying D Enterprises and ACTHA. 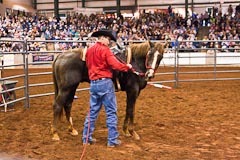 For sponsorship opportunities and more information on the 2011 Road to the Horse visit www.roadtothehorse.com or call 325-736-5000. Danielle Boyd is a Texas based writer, photographer and agribusiness public relations specialist with Hill Shepard Marketing Group. 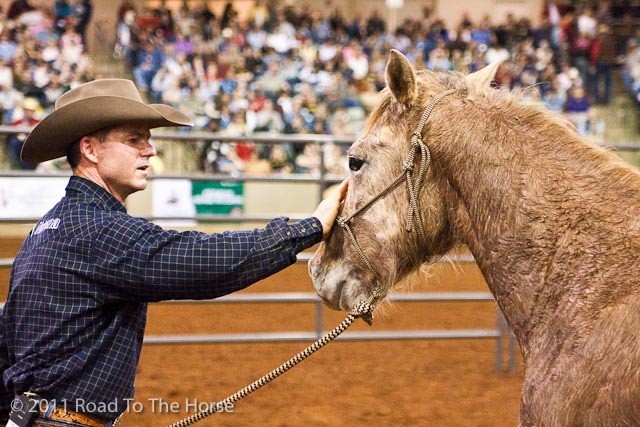 Comments for "2011 Road to the Horse"
Dee on March 15, 2011 How wonderful to have been there! Thanks for sharing.